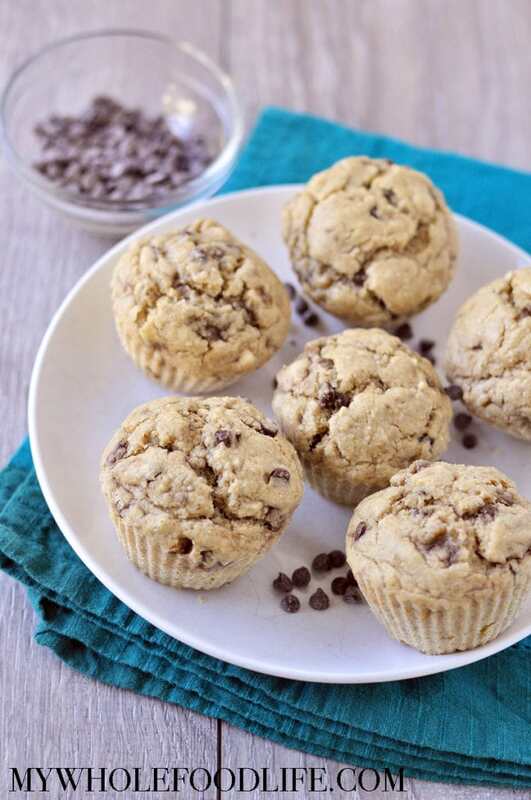 You have got to try these Banana Chocolate Chip Muffins! My 5 year old asked for a cupcake maker for Christmas. It was the one thing she begged for. I got it for her. I was thrilled she was taking an interest in baking! The cupcake maker came with a book full of recipes, but none of them were whole foods based. I had 3 ripe bananas I needed to use, so I created this recipe for banana chocolate chip muffins. 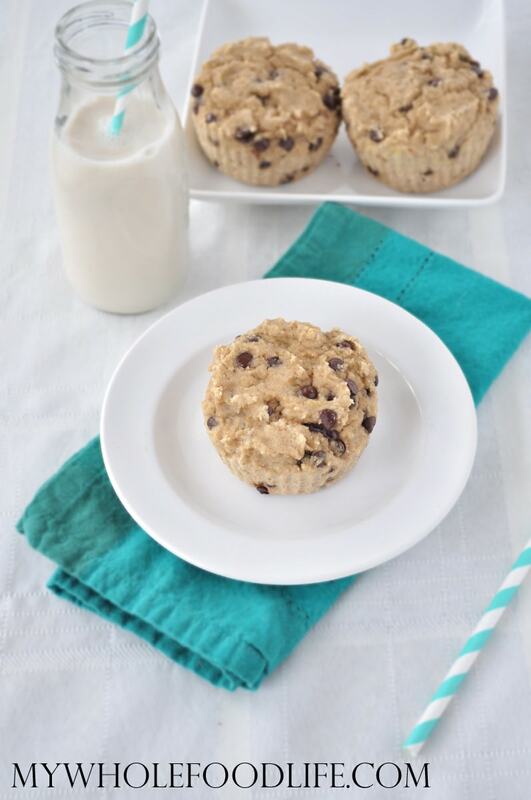 These healthy muffins are gluten free and vegan, with very little added sugars! The super ripe bananas were very sweet on their own. I made some of the muffins in the cupcake maker, and the rest in a jumbo muffin pan for my husband. I will write the recipe for an oven though. These must have been good because the girls ate every single mini muffin from the cupcake maker! There were seriously none left! I am glad I taste tested one right out of the oven! This recipe is super easy with only 8 ingredients! They are seriously good. Light and fluffy! If you like this recipe, you may also like my banana blueberry muffins or my chocolate zucchini muffins. I filmed a short video for this recipe. For more videos, you can subscribe to my You Tube Channel. Only 8 simple ingredients and less than 20 minutes to make this easy muffin recipe! Mix dry ingredients on one bowl . Spoon mixture into lined muffin pans . Let the muffins cool completely before removing them from the pans. Store in the fridge. You can also freeze them for longer storage! Enjoy! Hello, I am going to make these on Easter :) Not sure if this is a stupid question but should I use paper liners in my muffin pan when making these? I just bought the 3 inch silicone liners you use. Should I spoon the mixture into those liners and then place them in the muffin pan? I am new to baking muffins! Thanks! I love that your recipes import directly into www.pepperplate.com I've been using this for a while to easily keep track of my favorite on line recipes, and it's so convenient! Thanks for making my life a little simpler and healthier! You are so welcome Karen! Can you recommend a substitute for the maple syrup? You can use honey if you like. Wow were these scrumptious!! This recipe seems endlessly customizable too; at the last minute my crew decided they were more in a blueberry/nutty mood so I subbed a cup of blueberries and roughly half cup pecans and it turned out beautifully! Thanks for a fantastic recipe! You are so welcome! I agree it's very versatile! Could you sub coconut flour and coconut milk? Coconut milk would be fine. However, coconut flour is not as easy sub. I suggest using it only in recipes that have been written for it. Ok, what did I do wrong? These tasted very floury and were terrible (smelled good though) I used the sorghum flour. I made the recipe as written. Oh no! :( I'm not sure. When you added the flour, did you pack it in the measuring cups? You just need to loosely fill and level off. What size bananas did you use? Were they smaller? Hi! New to the gluten free baking and I only have coconut flour on hand. Would that work? The bag says to add extra eggs and liquid like coconut milk when replacing with coconut flour. I was thinking add an extra banana and double the almond milk? Suggestions? Coconut flour is very tricky to sub in recipes. It's best to use it only in recipes made for it. I experimented a bit last night. I substituted 1/2 peeled and diced Granny Smith apple and 1 1/2 tsp cylon cinnamon for the chocolate chips. My 7 yr old loved them! Where can I find the nutrition information for diabetics? Mainly the carb count. And, can these be made with either almond flour or coconut flour? thanks. Almond flour should work, but I am not sure about coconut flour. If you upload the recipe into My Fitness Pal or www.caloriecount.com they should be able to provide you with a nutrition label that should also have the carb count on it per muffin. I just bought Otto's cassava flour...can I sub it got flour in your recipe? Do I need to make other changes? I'm not familiar with that flour. It may work? Hello, I made these last night & followed the recipe to a T. In certain bites they’re incredibly bitter. I can’t figure it out? I'm sorry that happened. :( Do you think the flour could have been old?